It’s all people have been talking about at film industry events, festivals and major audiovisual markets for months. 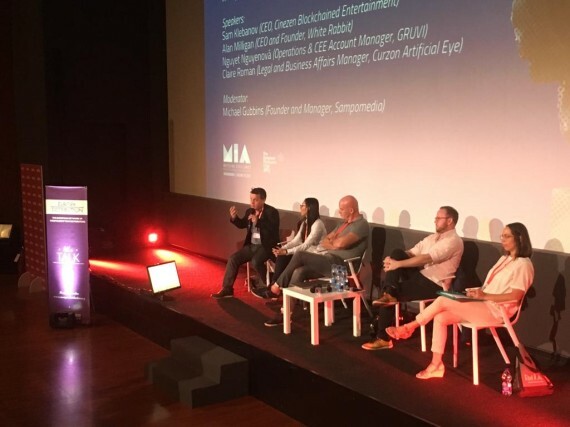 The revolutionary blockchain technology and its potential applications to the film industry also made an impact at the MIA – Rome International Audiovisual Market , where Europa Distribution organised a panel on the theme: “Everything you always wanted to know about distribution but were afraid to ask: Blockchain and its application to the distribution of films” on 20 October. With some help from experts and startup founders, the European distributor network aimed to explore this new Internet technology and its potential developments in more depth. What exactly is blockchain? How does it work? And what are the prospects for the independent distribution sector? In order to meet this need and to tackle difficulties that have emerged with the advent of digital technology at all levels of the film industry, a growing number of startups are developing specific applications. These include the BVoD Cinezen Blockchained Entertainment (Sweden) platform. “My background is in distribution, and this project stems from my frustration in seeing my industry at a standstill,” stated Sam Klebanov, CEO of Cinezen, presented as the world’s first decentralised BVoD market. “The problem today is the limited availability of content. Some films are available in some parts of the world and blocked in others. There are 3-4 platforms for each region, and they’re the ones who decide whether or not to promote your film. Distributors have also lost the ability to record their finances.” Cinezen’s solution is a public register that provides direct access to permanent and incorruptible transaction data, in order to promote transparency and verifiability. Every computer has the same database, when there is a system transaction, every computer records it simultaneously and everyone has the same access to the same information. This way, the money (in the form of tokens) must be transferred by the user to the rights holders, who are paid directly and can see transactions in real time. In order to tackle the current platform monopoly, which unquestionably decides which films to showcase, Cinezen is also proposing a system that recreates old video libraries managed by cinema enthusiasts: anyone who wants to take charge of their own content can create a virtual store and attract the own audience. The watchword is decentralisation: “If you don’t open access to content in the various regions, people will access it illegally,” is Klebanov’s conclusion. And it is precisely with data regarding piracy that Alan Milligan, producer, CEO and founder of White Rabbit (Norway), started his speech, with another interesting case study examined during the panel. “50% of Americans and 67% of Europeans pirate from time to time, and piracy has grown 55% from 2015 to 2016, because streaming services have increased and there’s too much exclusive content,” said Milligan, adding an important fact: “60% of pirates in Finland and Australia would pay for pirated films if they were given the opportunity. It is therefore access, not free films, that most motivates pirates.” White Rabbit is proposing a plug-in that can be installed in the browser and that recognises streaming content on any peer-to-peer site, allowing consumers to pay rights holders directly, according to a business model that gives 75% to the latter, 15% to White Rabbit and 10% to streaming sites, which are certainly not currently receiving any revenue from pirates. “We’re taking the peer2peer infrastructure and professionalising it,” summarises Milligan. For producers, this means not having to waiting months or years to be rewarded, but just a few minutes, once the user has made the payment, and to access all non-personal streaming data related to films and TV series. Claire Roman, legal affairs manager at Curzon Artificial Eye (United Kingdom), spoke about legal, contractual and business challenges related to the Blockchain VoD technology. Rather than providing answers, she focused on the questions that needed to be asked before entering this new universe. Assuming that “transparency is important, but personal data must always be protected,” a key legal issue is to establish which law is applicable, who is responsible for what, e-privacy and smart contract validity terms. Rights still need to be defined in the contract chain at a contractual level, as well as the distribution method (is blockchain a VoD sub or a different distribution system? ), with particular attention to be paid to sub-distribution: who are the third-party resellers? What is the sub-distributor commission? And then there is the question of intellectual property and, at a company level, editorial control (who is responsible? ), music rights (separate license?) and taxing crypto-currency proceeds. “We need to adapt blockchain potential to the world as we know it today,” observes Roman. A huge, revolutionary potential that will introduce online cinema and the entertainment industry to a new era of legality, free access to content and profitability.